Pro Cut Lawn Care & Landscape and our professional landscape designers in Grand Rapids work with a complete array of landscaping materials to build retaining walls and walkways. 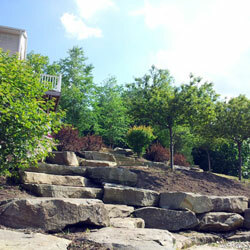 Hardscapes create a natural landscaped environment. Very often, residential or commercial properties feature areas with intertwined hardscape and landscape designs. Retaining Walls can be used to address those particular features of your property that are problematic or to create some depth and grandeur. Patios should be functional and attractive because this is where you'll spend much of your time outdoors. Entrances often present the "first impression" when a new visitor arrives. You'll want your entryway to reflect your personality and interests. Walkways should be attractive components that convey people to your house and property in a welcoming and comfortable manner. Ponds and Waterfalls can turn any yard into an outdoor oasis. We will strive to enhance the look of your home or business, making it appealing to your guests or customers. Contact the Grand Rapids hardscape construction experts at Pro Cut Lawn Care & Landscape today free estimate or call us directly at 616.421.4148.